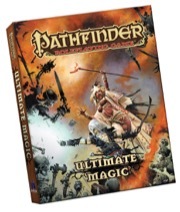 Raise your character to the pinnacle of magical might with Pathfinder Roleplaying Game Ultimate Magic! Within this book, secrets arcane and divine lie ready to burst into life at the hands of all the spellcasting classes in the Pathfinder Roleplaying Game. In addition to the brand-new magus class�a master of both arcane magic and martial prowess�you'll also find a whole new system for spellcasting, rules for spell duels and other magical specialities, and pages upon pages of new spells, feats, and more. Because when it comes to magic, why settle for less than absolute power?